When I first visited the Mercer Museum last year, more than just handtools caught my eye. 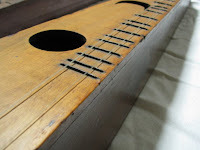 I was intrigued by folksy musical instruments, called Scheitholts (also Zither or Zitter). The Germans who settled in Pennsylvania and other parts of Colonial America in the early to mid-1700s brought the zither, or at least the idea of the instrument, with them. The ones on display in the museum’s current exhibit "Everyday Rhythms" are 19th c . However, a few 18th c. zithers are know to exist, including a 1781 instrument on loan to the museum and one in the Colonial Williamsburg collection, which is represented in a photo enlargement. Zithers (both those played with a pick or quill and those played with a bow), dulcimers, and other early musical instruments are included in this special exhibit which will run through May of next year. 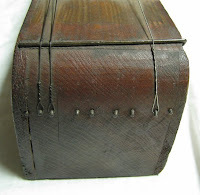 Permission to include the photos I took provided courtesy of the Mercer Museum/Bucks County Historical Society, Doylestown, PA.
Zithers, although each one slightly different, are basically a tapering, hollow (but for the solid wood head) trapezoidal-shaped stringed instrument. 3 melody strings were accompanied by multiple, perhaps 6, drone strings and were plucked or strummed with a quill. Songs played on zithers tended to be slow and produced a deeper sound than that of a dulcimer. At the “Everyday Rhythms” exhibit, you can hear melodies played on a reproduction zither. The strings, most likely made from animal gut, were tightened by iron or wood pins and passed over wire staple frets, of which there were normally 14. The instrument typically rested on a table top with the strings nearest the player as he/she strummed. Although more refined and ornate versions of the scheitholt were made professionally in Europe, the one s discovered in Pennsylvania are much more modest and practical. Nonetheless, craftsmen decorated their product with simple carvings, cutout shapes, and chamfered edges. I contacted the museum’s Vice President of Collections and Interpretation who granted me some alone time with two zithers and permitted me to take measurements and photographs. He also offered me a stack of information about the instruments from which much of this information was obtained. One of the zithers I examined is left-handed, has 19 frets, and has cutouts of a circle, a crescent, and an “S” in the soundboard, which may be interpreted as initials: O. D. S. There are remnants of a reddish stain and the strings are secured with carved wood pegs at the tail end of the instrument. The other zither is a little more elegant, with a shaped tuning head on one end and a round over on the other. The soundhole is made with semi-circle shaped holes and with punched indentations for decoration, presumably. 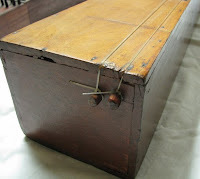 Instead of wood pegs, strings are held in place with brads. The soundboard on zither #1 is 1/4” thick while zitter #2’s soundboard is 1/16” - 3/ 32” thick. Both zithers’ sideboards are made from 1/4” thick lumber, and the tuning heads are solid wood. Zithers were enthusiastically played throughout the 19th century among German speaking communities, and yet original instruments are difficult to find.